Both Verizon and AT&T had moderate coverage. We did not have any issues calling, working out of the RV or streaming Netflix during our stay (without a booster). Sunriver is a small town located about 15 miles South of Bend off Highway 97 and has an elevation of roughly 4,150 feet. It sits just east of the Cascade Mountains and right along the Deschutes River. The land that Sunriver is today was once a lake bed that eventually dried and became a thriving meadow where Native Americans and explorers lived and passed through. Also worth mentioning, Sunriver was home to a World War II training facility named Camp Abbot which was abandoned sometime during the summer of 1944. You will still see the name of the camp around town today. The area is plentiful in things to do and see, from hiking and floating down the Deschutes to exploring the local breweries and culture in downtown Bend. 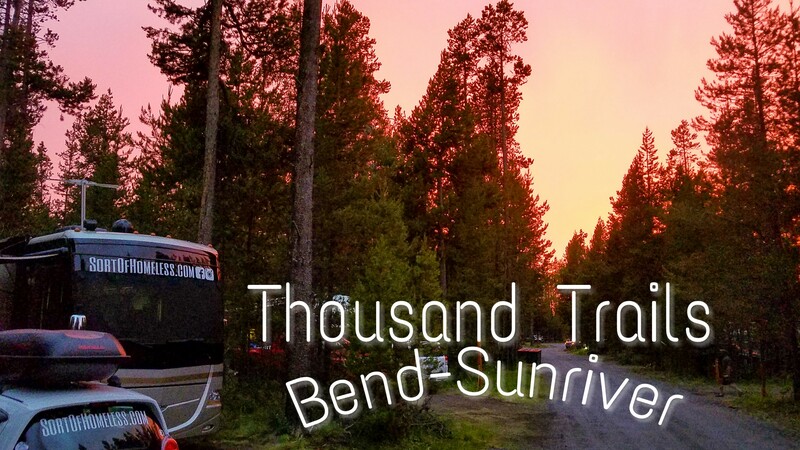 The actual town of Sunriver is only a short 5 minute drive away from the campground and is home to your basic wants and needs (grocery store, several restaurants, a brewery, gas station, etc). If there’s something specific you are looking for or just feel like exploring a bit, then Bend is your best bet and is just down the road! We were ecstatic to discover a Trader Joe’s in Bend and used the opportunity to stock up on some of our favorites (helloooo dark chocolate peanut butter cups! )…more than once! We also frequented several breweries, cideries and pubs (Crux, Deschutes, Spoken Moto, McMenamins and Atlas) of which Bend has plenty! We also took the motorcycle for a drive up to Mt. Bachelor one afternoon, which was only a 30 minute drive from the campground – and they were skiing in July!! We also checked out Pilot Butte in Bend one evening, which would be a perfect spot to watch the sunset. The campground is an extremely nice and well maintained Thousand Trails park with 317 campsites available. It was quite busy during our stay as Summer is the prime season to come for a visit with the weather being quite dry and mild, for the most part. Most days saw highs in the 80’s, although, we did have a couple of days where it reached well into the 90’s. Out of the 13 sections (A-M) there are three that are 50 amp (A, B, D), but the majority of sites are 30 amp and all sites have water hookup. Sewer is not an option here, but in turn, there are two dump stations available in the park. If you happen to be close to one you should expect it to be a high traffic area! They also offer honey wagon service at the low, low price of $25 per pump out – what a bargain (sarcasm)! Even during the busy season, sites were readily available, but finding one with satellite access could be problematic. The majority of this park is heavily-treed with some splashes of sun. One negative (and we are really reaching here) was the dust! We were near the dump station in section “I” and by the end of the day, our car and the front of the RV accumulated an impressive layer of dust. Also worth mentioning, the campground had truckloads of gravel brought in right before the 4th of July crowd was expected, which could have been done to cut down on dust or to try to slow down the speeders, or both perhaps. Bend-Sunriver is not package/mail friendly, which surprised us a bit. They will only accept medication and RV parts. Included in your check-in documents they give you a list of places in the area that will accept UPS and FedEx packages as well as the local post office contact information for General Delivery. Despite being inconvenient for full-timers like ourselves, we do understand that managing Amazon deliveries on a daily basis for a park of this size is time consuming. 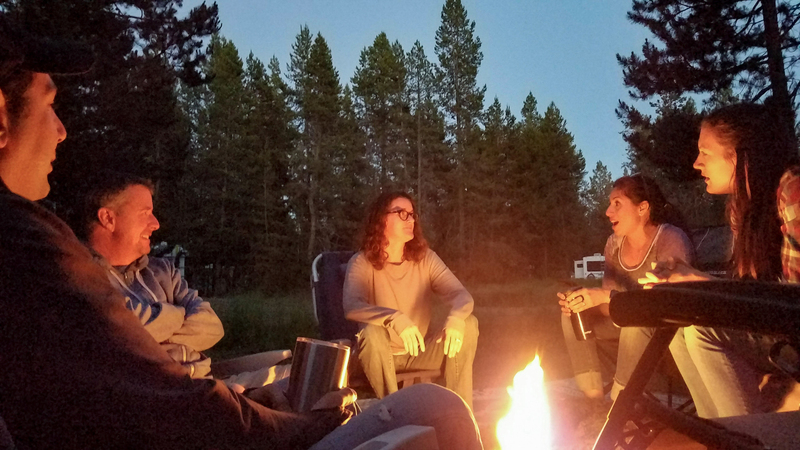 Although we don’t usually partake in a lot of what campgrounds offer as far as activities, we were quite impressed with what Bend-Sunriver maintains. Some features include: swimming pool, horseshoes, tennis and pickleball courts, basketball court, general store (with a decent selection of beer, soda and household staples), adult lodge with wifi and a laundry facility with plenty of washers and dryers. You are also able to rent kayaks for the day here, which we found extremely convenient when the temps soared into the 90’s and the Deschutes River was calling our names! Overall, this was a great three weeks! We were able to amass a solid crew of other travelers and there were social hangouts on a near nightly basis. Combine that with our first exposure to the unique town of Bend and it’s tough to beat. The natural beauty and incredible weather was second-to-none in our travels. It was warm (sometimes hot) during the day, cool at night and low humidity. There was one evening where there was a short drizzle but that was the only time we had any precipitation. Being there over the 4th of July was a bonus as well. We saw the Bend fireworks set off from Pilot Butte and visited the annual Pineville Rodeo – all American fun! We fell in love with the scenery and everything Bend has to offer. It was definitely a positive experience all around! SOH Score (1-10, 10 being the best campground imaginable): 8.5 – We would give the overall experience an 8.5 – it was that good. Bend is such a cool town and surrounded by some pretty stellar landscape. Throw in the fantastic food and beer and you have yourself one happy full-timing couple! The campground itself, we would give a 6.5. Having no sewer for 3 weeks and the constant dust was less-than-optimal, but it was a great base camp for exploring, working and socializing. Have any questions about this park? Have you stayed there and have a different take or something to add? Send us a message or comment below! ⟵Product Review: Magne Shade – No ladder, lots of shade!